“My major work on the farm is just picking the harvest,” says Raghava with a straight face. It takes some time for the fact to sink in that this young farmer is not joking. One begins to believe him only after visiting his coconut plantation in village Mallanayakanahalli in Karnataka’s Devangere district. Unlike the carefully manicured look of most coconut plantations, Raghava’s eight-hectare (ha) farm is overrun by leguminous vines, raintrees, fruit trees and medicinal weeds. The ground is covered with thick mulch and there are patches of tangled undergrowth only Raghava can walk through. “It has not been cleared since 2002,” he says. In neighbouring Shimoga district, another farmer Nandeesh, also in his 30s, owns a two-hectare areca plantation where an assorted mix of trees, bamboo thickets and velvet bean vines grow merrily between the areca palms. “The average yield in the region is 600 kg nuts per acre (0.4 ha) but I harvest 800 kg to one tonne from as much land,” he says. Nandeesh also harvests just as much grain from his six ha paddy field as the other farmers in his village Churchigudi, without tilling or using any kind of fertilisers or farmyard manure. Several natural farming experts visit the farms of these two young farmers from time to time and offer guidance. In times of fast-depleting soil health and rising labour costs, Raghava and Nandeesh have brought down their farming costs and improved soil fertility, says veteran natural farmer Raju Titus from Madhya Pradesh. Their practice holds valuable lessons for the country’s farmers, he adds. 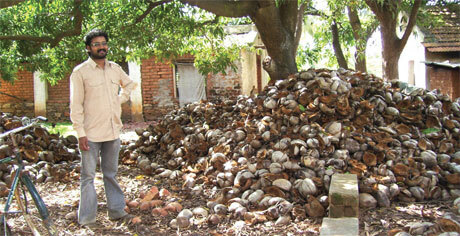 Raghava inherited the coconut plantation in 1996 after his grandfather passed away. He was an undergraduate then. “At that time the yield was 30,000 to 40,000 coconuts a year,” he recalls. For additional income, his family used to lease the land between the trees to other farmers for growing crops like sorghum and turmeric. These crops required regular tilling and heavy chemical inputs. Raghava, who had heard of concepts of “do-nothing” and “till-free” farming, stopped the intercropping. But the farm was soon filled with weeds. A large part of it got flooded due to water seeping from nearby paddy fields. Nearly half of the trees stopped yielding. There was no harvest in the second year. Meanwhile, having completed his graduation, Raghava was away for two years to study MBA. His family wasted no time in restoring the old leasing system. After completing MBA, Raghava had a second go at till-free farming. This time he took care to dig channels to drain the excess seepage water, and planted leguminous vines like velvet bean and pueraria between the trees to prevent regeneration of weeds. “Once that was done, I left the plantation alone, and discharged most of my labourers except the watchmen,” he says. Artistically inclined Nandeesh, who gave up formal studies after 12th standard, was forced to manage his plantation in 2000 after the death of his father. “The one thing I did not want was farming should take up all my time and mental space. So I immediately started looking for ways to cut down the cost and labour involved in farming,” he says. He came across books of Japan’s natural farming guru Masanobu Fukuoka who preached no-tilling. He read more books on natural and till-free farming, and stopped tilling his areca plantation. He planted bamboo to bring down the ambient temperature and introduced a range of leguminous plants, including velvet bean, puereria vines and touch-me-nots. He also stopped tilling his paddy field. “Puddling the land before transplanting the seedlings is sufficient,” says Nandeesh who also switched to traditional paddy varieties. After harvesting paddy, he broadcasts legumes—green gram with some amount of black gram, horse gram, wild horse gram and cassia tora—as second crop. The remains of these plants then act as green manure. 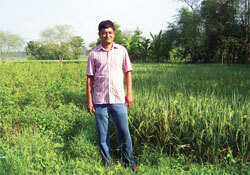 Raghava’s second attempt at no-till farming yielded results. Within a year, the leguminous vines spread over his land, crowding out the weeds. The ailing coconut trees began to recover, and bore fruit. With weed control, a variety of plants—rain trees, guava, mango, custard apple, papaya saplings and medicinal plants—appeared on their own. “My irrigation needs have come down to one-fourth in the past five years,” says Raghava. In the past three years, Raghava has been harvesting 70,000-80,000 coconuts a year, almost twice the yield he started with. “The national average is 50 coconuts per tree a year, whereas I harvest 70 to 75,” says the young farmer. He earns an additional Rs 30,000-Rs 40,000 per year from selling raintree wood. Fruits come as an added bonus, though most of it gets consumed by family and friends. The tangled undergrowth has also brought down thefts, which are common in coconut plantations. Recently, when G Krishna Prasad of the Organic Farmers Association of Karnataka visited Raghava’s farm, he learnt that his farming technique is called analog forestry. “I didn’t know about it. It just happened,” he says. Nandeesh achieved similar success. His irrigation requirement has reduced by two-thirds and legumes have taken care of weeds. “This has cut down my labour cost to three-fourths,” he adds. “I have to clear away patches of undergrowth periodically to make way for plucking areca nuts. This causes 8-10 per cent yield loss but that is inevitable,” he says. “Cost of labour and seeds has also reduced on my paddy field after I learned a lesson from nature,” he says, recalling an incident. Traditionally around 62 kg of paddy seeds are grown on a small patch of land for sowing a hectare. One year, thanks to a drunken watchman, 75 per cent of his seedlings meant for 1.8 ha were eaten by parrots. “I transplanted the remaining 25 per cent across the field. Instead of eight to 10 seedlings per hill, I transplanted only three. They grew up so strong that the yield from the land remained the same,” he adds. Though a variety of weeds and pests exist on his land, there has never been serious damage. All pests are not bad. For instance, the leaf cutter that gets active at the time of ear-head formation is actually good, because big leaves cut off sunlight to the ear-heads and too much vegetative growth in a plant can reduce yield. The trick with weeds and pests, he explains, is to keep them within natural limits, not exterminate them. Having started with an income of Rs 10,000 per ha, Nandeesh now earns Rs 100,000 per ha, partly due to the good market price of unpolished traditional rice. He is, however, still looking for a successful natural technique to replace transplanting, which is labour-intensive. “I tried Fukuoka’s seed ball technique on one patch last year, but failed. I also have to find a viable cover crop to control weeds,” says Nandeesh, who now spends his spare time training other farmers in natural paddy farming. This is great, couragious and Challeging. One day I will come to this farm to learn their experience. Brilliant! Just as nature should be.... natural. An additional read is Michael Pollan's Second Nature... He talks about not trying to twist nature's arm to do our bidding, but to work with nature in a symbiotic relationship. i am from Chikmagalur, working in Bangalore.